This beautiful silver pearl jewelry box decorated with pearl and crystal accents surrounding the lid. Perfect gift for women of all ages. The inside of the box has a smooth felt lining. 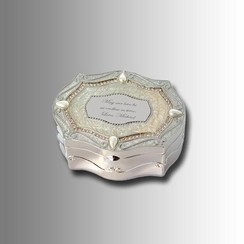 Engrave the silver plate on the top with names or a message.